john4jack (Corvallis, Oregon, United States) on 24 August 2012 in Miscellaneous and Portfolio. Typically ugly - nice frame. Une gargouille sortie de son élément. Belle image Jack. Beautiful detail! This face is expressive! Excellent! Quelle stat3ue dans ce jardin fantastique cpatage. Les détails sont splendides, très belle lumière. Bonne journée. Now that could scare you in the dark. What a face. Nicely lit! Ha, what a coincidence... I have a post of garden ornaments today also. I love the brilliant tones of your IR images, they just glow with radiance! :) very nice & wonderful! Quite a subject. Beautiful capture. I like objects like this in IR more than landscapes. Nice one. 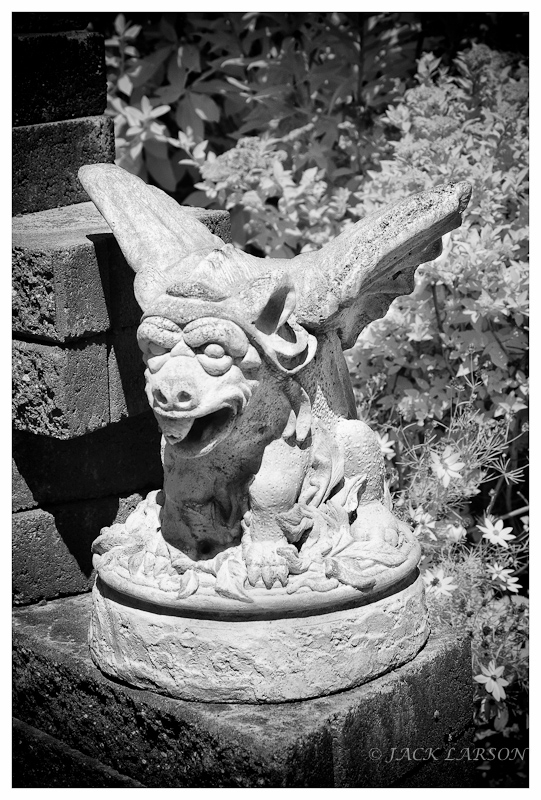 The details and textures of this interesting gargoyle are fabulous ... Nice b/w shot !!! Gorgeous shot in b / w. Nice details and textures. Well done. Great shot and beautiful gargoyle! Wonderful image! A great gargoyle! I love Nigel's typically ugly remark : ) Too funny. It's a beautiful ugly for sure.